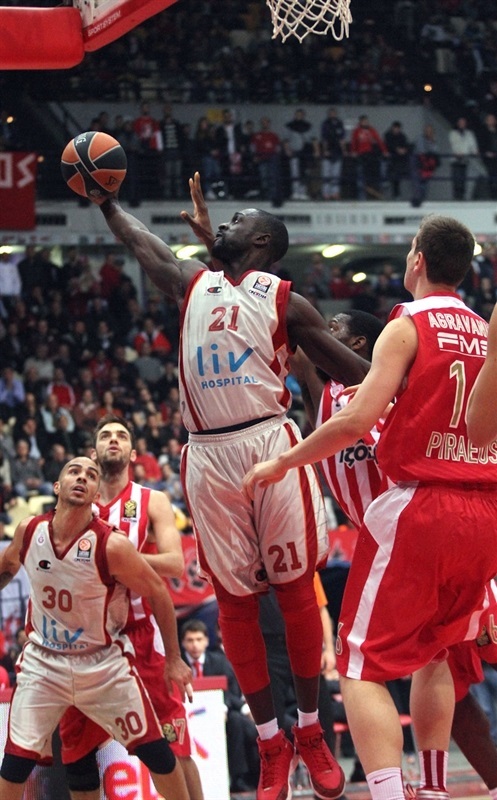 Reigning Turkish Airlines Champion Olympiacos Piraeus remained unbeaten, downing Galatasaray Liv Hospital Istanbul 72-54 for its seventh win in as many games. Olympiacos had already claimed a place in the Top 16, but now all but secured the first place in Group C. Galatasaray dropped to 4-3 and will hold at least a share of second place at the end of Round 7. The hosts never trailed, pulling away for good late in the second quarter. The Reds had 35-24 advantage at halftime and used an 11-2 run in the third to extend it to 51-31 and cruise the rest of the way. 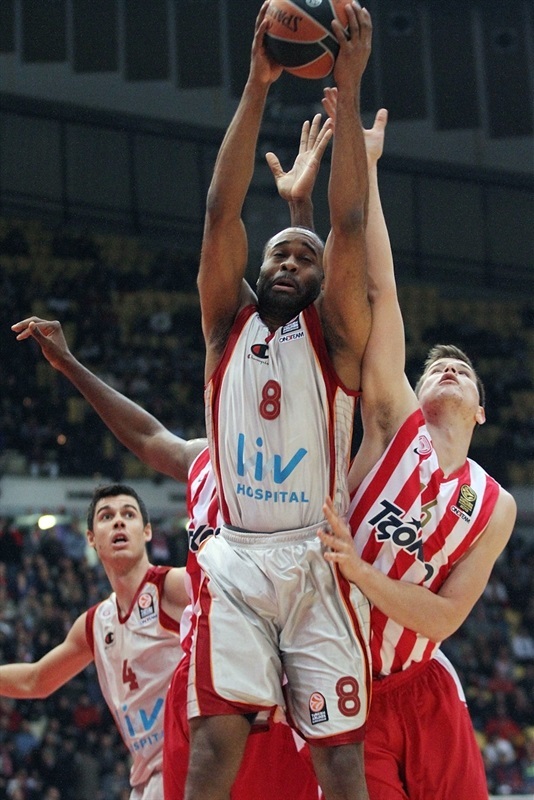 Bryant Dunston paced the winners with 18 points, 5 rebounds and 3 blocks. 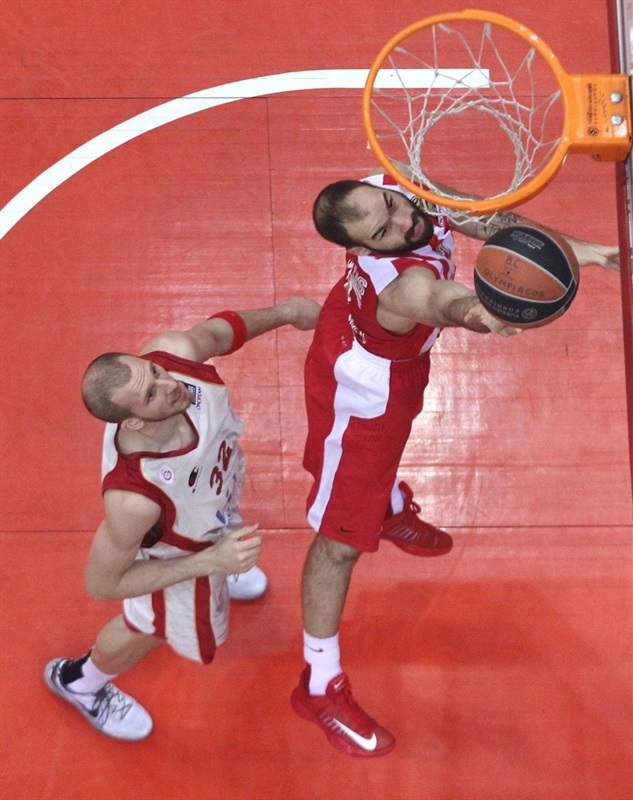 Vassilis Spanoulis netted 12 points, while Georgios Printezis had 9 in victory. Furkan Aldemir had 10 points plus 7 rebounds, and Sinan Guler also scored 10 points for Galatasaray, while Ender Arslan netted 9 in defeat. Dunston started the scoring with a reverse layup, before Guler made a put-back on the other end. Dunston was a big presence inside from the start, driving the baseline for a layup, but Carlos Arroyo hit an off-balance jumper and Guler made a layup to tie the game at 6-6. 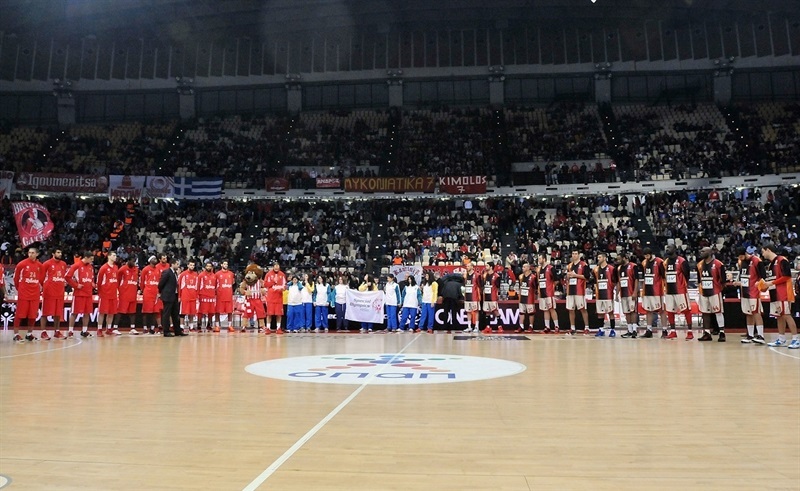 However, Olympiacos answered with an 8-0 run, during which Spanoulis made a couple of driving layups, and Dunston scored a dunk and a layup to make it 14-6. 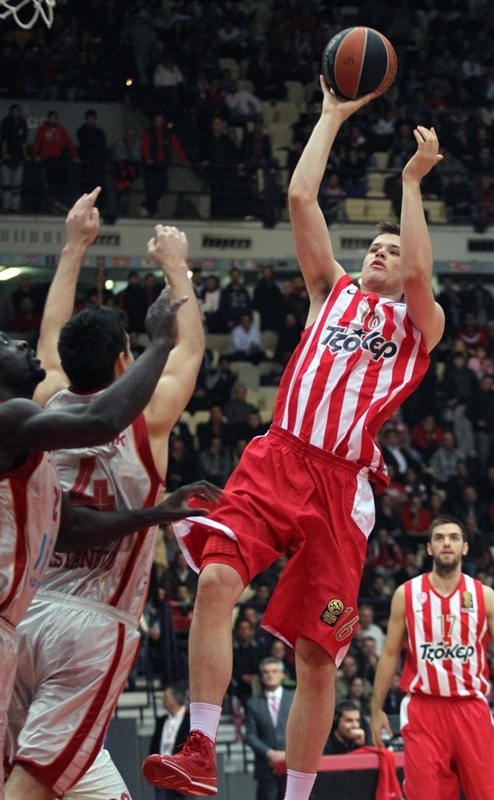 Guler scored droving to the hoop, before Printezis scored from close range. Before the quarter's end, Aldemir made a layup, but Mirza Begic scored inside, rounding out an 18-10 Reds lead after 10 minutes. An Aldemir put-back and Ender Arslan floater got Galatasaray going in the second quarter, and after Printezis made a tough shot, Aldemir scored twice inside, including a dunk to make it 20-18. But Kostas Sloukas hit a triple, and Acie Law assisted Brent Petway for a monster alley-oop dunk and 25-20 lead. Dunston added to the tally with a layup, and Petway's fastbreak dunk extended it to 29-20. Hairston's tip-in ended Galatasaray's drought from the field, but Spanoulis sank a quick triple, and Matt Lojeski hit a wide-open shot from behind the arc for a 35-24 halftime lead. 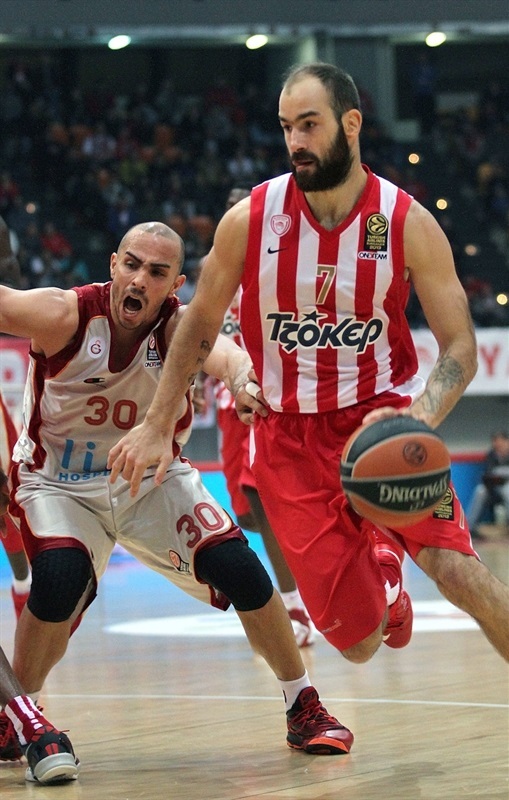 Spanoulis started the third quarter with a steal leading to a fastbreak layup, and Vangelos Mantzaris sank a three-pointer to make it 40-29. After Pops Mensah-Bonsu made a layup-plus-foul, Begic’s block led to a fastbreak layup by Printezis. Guler answered with a driving layup to make it 42-31. 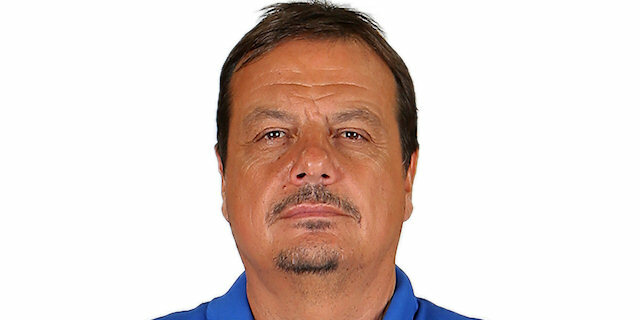 However, back-to-back triples from Printezis and Spanoulis extended it to 49-31 midway through the third quarter, forcing Galatasaray head coach Ergin Ataman to call a timeout. But not much changed afterwards. Layups from Begic and a jumper from Sloukas made it 55-35 as Galatasaray's only points came from the foul line. A hook-shot from Begic and a layup from Lojeski made it 59-35 through three quarters. Dunston made a pair of layups in the beginning of the fourth quarter, but Cenk Akyol and Arslan sank back-to-back three-pointers for Galatasaray, 63-41. Dunston answered with another layup, and Lojeski went coast-to-coast for a layup and a 67-41 lead. Huseyin Koksal’s layup-plus-foul was the only basket on either end in a span of almost three minutes, before 19-year old Ioannis Papapetrou nailed a three-pointer for his first-ever Euroleague basket, 70-44. A fight between Begic and Mensah-Bonsu delayed the game for 10 minutes, and earned ejections for Mensah-Bonsu, Begic and Printezis. The visitors scored 6 of 8 free throws in the remaining time, and Akyol hit a three-pointer, while Dunston had a dunk and a layup on the other end, closing out the game. "We secured our participation in the Top 16 and probably first place in the standings of Group C and this is very important given the fact that we've been hurt by injuries. Tonight, Brent Petway suffered an injury to his shoulder and we don't know his status. We moved the ball well and played good defense, especially on Carlos Arroyo, so the victory came safely. Unfortunately the incident which happened in front of families and children was not the proper epilogue on such a night. After all, Olympiacos is running 17-0 in official games and this is a great result, which makes us smile because the team keeps its consistency despite the injury problems. We feel proud for the job we have done so far and this is a reason to congratulate all the players, including Vassilis Spanoulis for the award he got tonight and it is a honor for him and for the whole club." "It is not easy to make comments after the poor performance of my team especially in offense. In the first half we managed to stop Olympiacos from scoring too much, but we had miserable shooting percentages and under these circumstances it was impossible for us to remain competitive and fight for the victory. Honestly I want to apologize for the incidents that happened tonight. We will punish our player, Bonsu-Mensah, and I hope that Olympiacos will do so with Begic. The two players damaged the game and the good atmosphere. Olympiacos and Galatasaray have good relationships and I hope that we will keep this friendship."